The Latest version of our best selling Three Mifi device, a whole new wireless hotspot you can take anywhere. Mobile Wi-Fi sends out a signal so you can connect to the internet without needing any wires. This means you can connect different devices at once. So while you're checking emails on your laptop, you can download tracks and apps on your iPod touch. 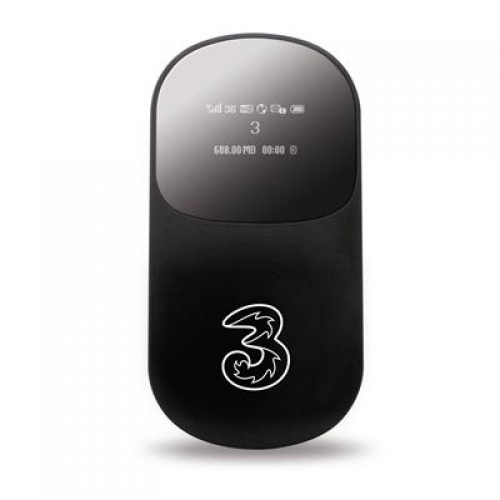 The modem will automatically connect to the 3 network and switch on the WiFi signal. Once the device has connected you will see the following icons on the digital display which allows the user to easily see device status. These alert icons are similar with those used today for handsets. Just turn on your wireless modem, switch on connection to the 3 network, and select the Wi-Fi function. Then choose the Wi-Fi option on whichever device you're using. There's no need to load any software to get online using the wireless modem. How is it different to mobile broadband? The main difference is that Mobile Broadband only works with your laptop, whereas Mobile Wi-Fi lets you connect other Wi-Fi-enabled devices, like the iPod touch. And because it's a wireless connection, you can connect more than one device at a time.